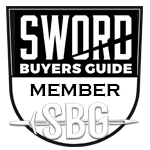 Generally have an interest in most training swords, specifically Saber, Rapier, and Smallsword. Also any steel or aluminium weapons designed for use on Stage or Film I have an interest in. Hanwei Practical Rapiers, Pecoraro/Radaelli/Hutton sabers, CS Practice Sabers, MRL practice sabers, FIE non electric fencing sabers are also welcome. I may be willing to trade with others in North America. I have a list of swords up for sale or trade here. If your still interested in fencing gear I have a cold steel ribbed shell rapier that is a fully functional piece and would just require a tip plug for practice.